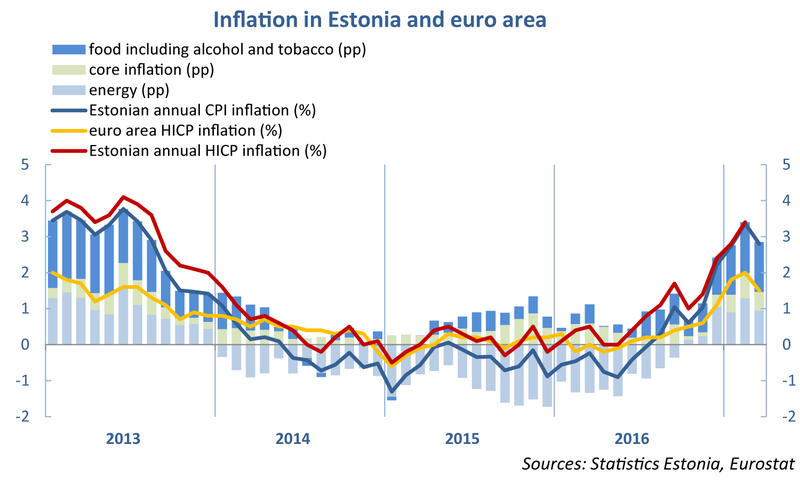 Data from Statistics Estonia show that consumer price inflation slowed to 2.8% in March from 3.4% a year earlier. The price level was 0.3% higher than in the previous month. Energy prices were up 7% over the year and prices for foodstuffs, including alcohol and tobacco were up 4.5%, while core inflation remained low at 1%. Price pressure weakened a little on the world market in March, and that was reflected in Estonian consumer prices too. The crude oil price was down at the start of March on world markets as oil production increased in the USA, offsetting the earlier production limits introduced by OPEC countries. Food commodities were also cheaper in March than in February, with data from the UN’s Food and Agriculture Organization (FAO) showing prices down 2.3%. Cheaper oil had an immediate impact on Estonian consumer prices as motor fuels fell in price by 1.3% over the month. Rises and falls in food commodities on world markets usually pass through into Estonian prices over three quarters. Around half of the rise in food prices, or two percentage points, was due to the rise in excise on alcohol and tobacco at the start of this year. As companies built up big stocks at the end of last year, the tax impact of this rise has so far passed through into consumer prices more slowly than the rise last year did. For this reason it may be assumed that the excise rise will affect prices further in the months ahead. Average inflation in the euro area slowed in March from 2% to 1.5%, partly because of the low rate of core inflation. Core inflation is an important figure for monetary policy, as it is observed together with other key indicators for the economy. Core inflation in the euro area, from which the volatile prices of energy and food are excluded, slowed mainly because of manufactured goods. These fell further in price in several larger euro area countries even as the prices of raw materials and the intermediate goods used in manufacturing were up on the year. As core inflation is dependent on economic activity, and surveys indicate a continued increase in economic activity in the euro area, it may be assumed that core inflation will rise during the year.